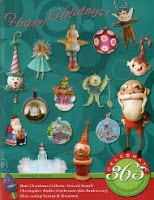 Happy Holidays: I have been collecting bits and pieces to replicate antique magic props. I have been collecting bits and pieces to replicate antique magic props. I love stage magic. When I was a young teenager I took lessons with a local magician from the Victoria Magic Circle. I didn't last to long at it but I did realize that what I liked was the magic apparatus, costumes, and stage sets. It is interesting that the things I liked as a child and young teen are becoming the areas that I am looking to for inspiration. 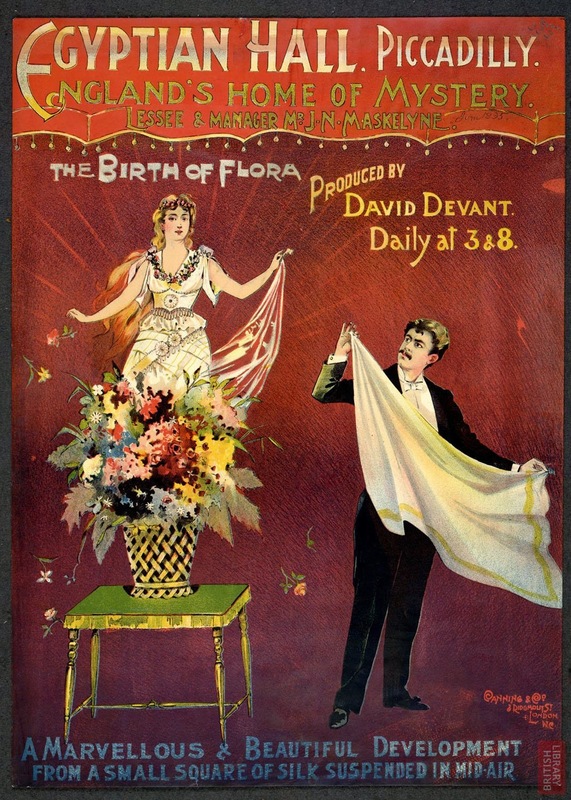 This early poster shows the set for one of Frederick Bancroft's performances. 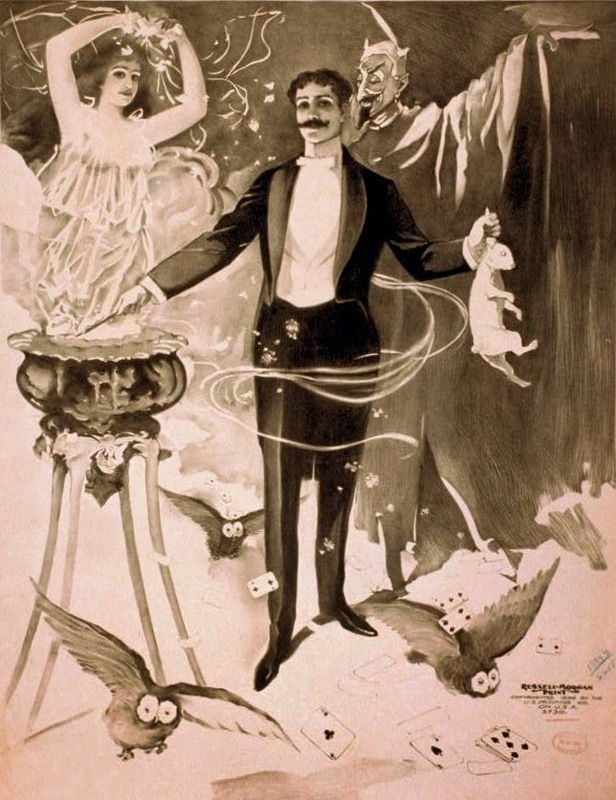 The early magic apparatus was much more elaborate and exotic than the magic of today. It was a simpler time, I am not certain that this style of stage magic would be popular with todays technology savvy audience. 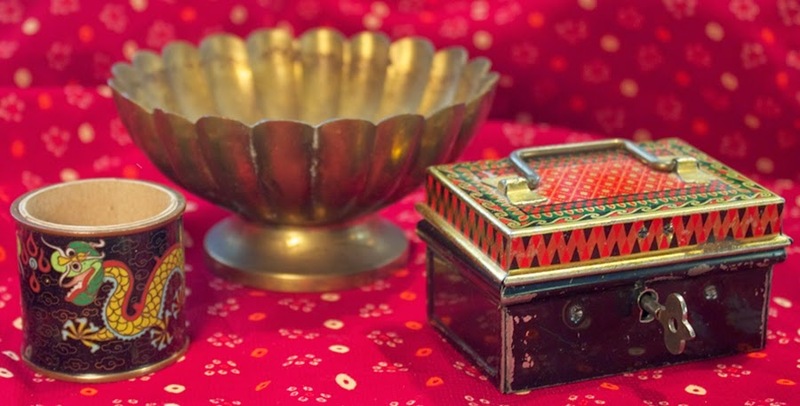 The magician is producing ribbons, flowers, playing cards, owls, a rabbit, as well as a beautiful assistant from the elaborate brass bowl on the stand. During the last couple of years I have been collecting things to be used for my magic themed sculptures. 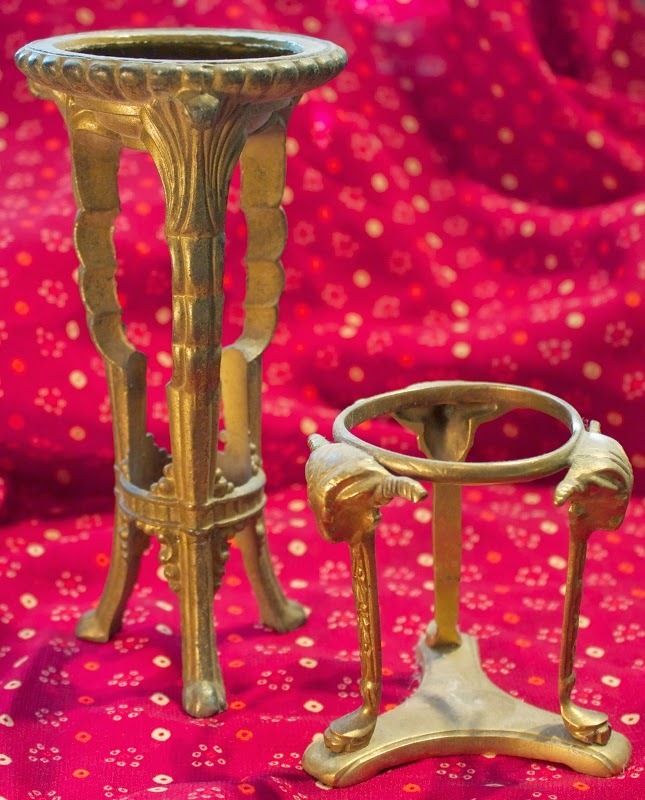 These two brass items I believe were once used as parts to elaborate lamps. They will make perfect table bases for the magicians tables. 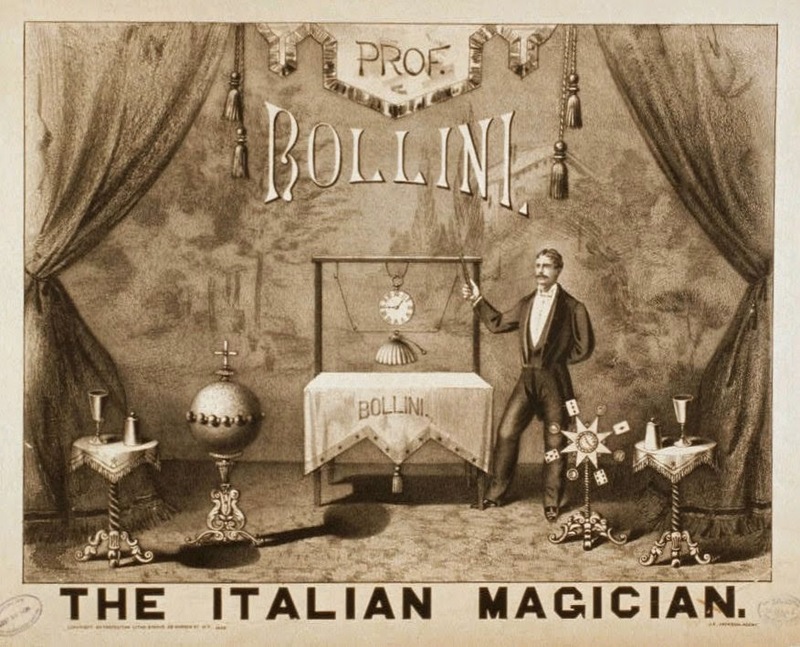 I love the elaborate table bases and magic props that Prof. Bollini, the Italian magician used for his stage show. There is a hint to the scientific with that large sphere on the left of the picture. 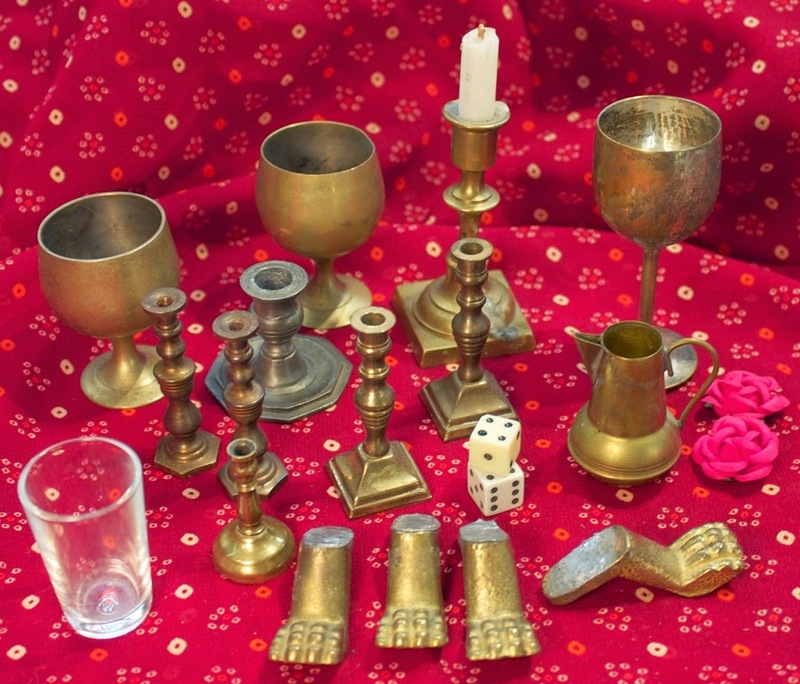 I have collected quite a few brass pieces as well as the occasional pewter item such as the candlestick holder on the left close to the back of the picture. Those brass covered pot metal feet will be used as the base for the lamp shade that I showed you at the end of this post. 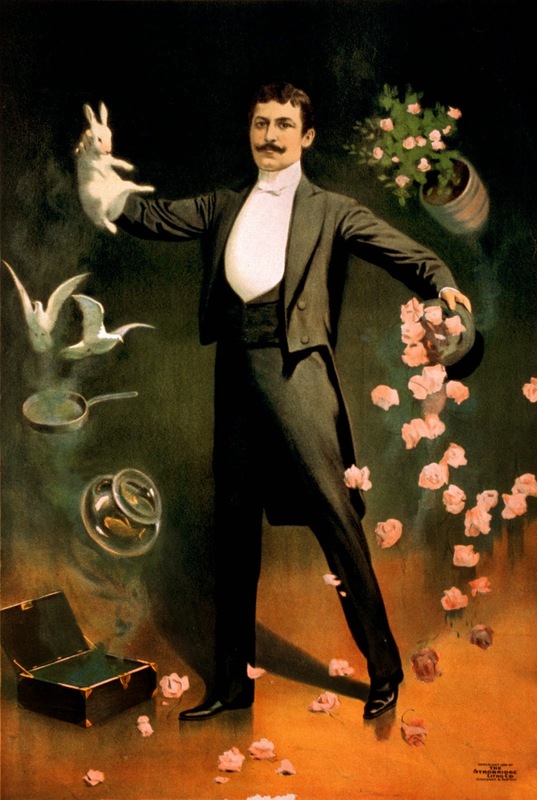 A pan overflowing with roses, a large flowering potted shrub, a rabbit, a chafing dish that has produced two live doves, and a bowl of goldfish have all been magically produced from the suitcase at the magicians feet. This double sided portrait rattle was my first magic related piece that I produced, it is in my personal collection. The first side is titled "The Amazing Levitating Lantern" and the reverse side is called "The Man-in-the-Moon Loves Magic Tricks". 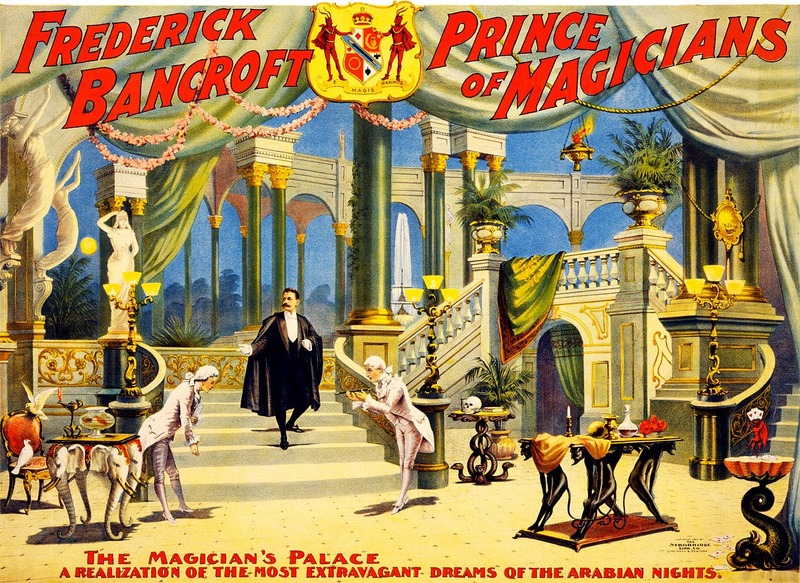 I would loved to have seen the magic shows presented at "The Egyptian Hall" in London, it is long gone. It was a theatre owned by the magicians Maskelyne and Devant. This cloisonné napkin ring has two great dragon images on it. I have made a cardboard insert to create a cylinder to produce silk handkerchiefs. The brass bowl in the back may have a large production of flowers produced in it, I'm not certain. 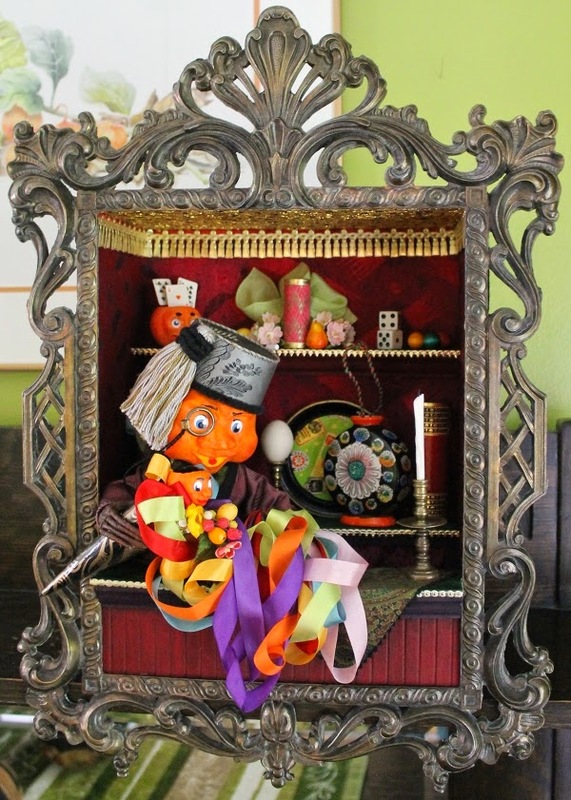 The small cashbox was going to be used in my shadow box sculpture "The Magic Shop" shown at the end of this post but it was a little too large and just didn't look right. 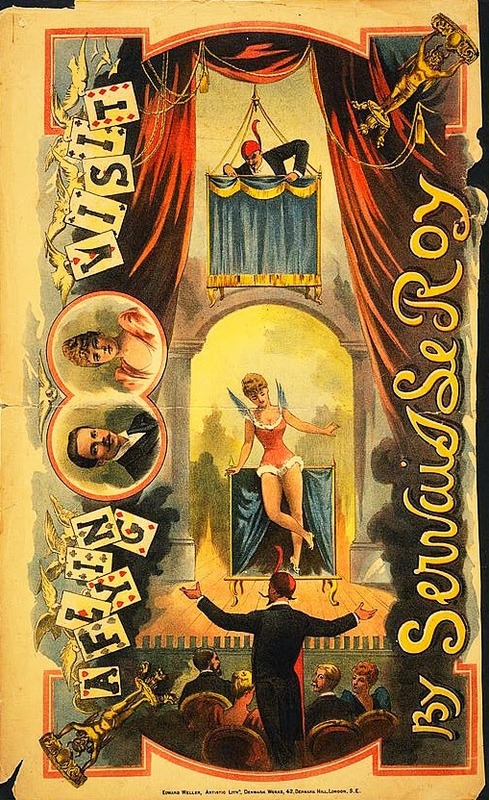 Draped velvet curtains held back with cords and tassels, heavy bullion fringe edging the curtains, and cherubs standing on claw footed bases holding elaborate trays above their heads to create a table all typify the elaborately elegant evening shows held in the theatres of the Victorian and Edwardian eras. 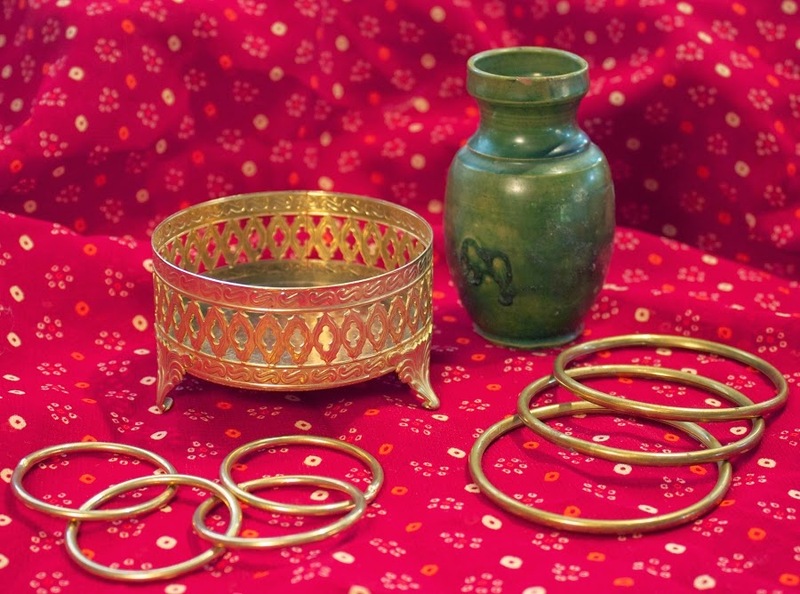 Brass rings to be used with a figure doing a trick known as "The Chinese Linking Rings". The brass footed tray will be turned into an exotic stool. I am not certain what the green vase will be used for but I love the exotic look of it. 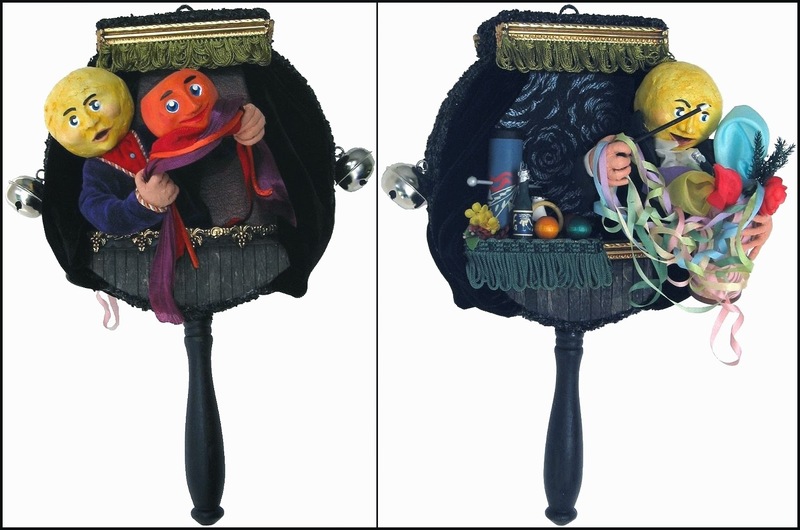 My shadow box sculpture "The Magic Shop" was inspired by the early businesses that catered to magicians offering them the latest tricks available. I remember as a young teen going into "The Trick and Joke Shop" on Fort Street in Victoria with my mum, dad, and brother. The interior wasn't as elaborate as this by any means, seedy would probably best describe it as the fellow behind the counter showed us crude "joke" items to begin with and then changed his sales direction. Needless to say my mum left the shop. I much prefer my shop that only caters to magicians. If you haven't checked out my Etsy shop please do have a look. I will be adding more items in the near future. Our daughter, her husband, and their little boy are visiting us from Toronto for a while so it won't be as soon as I had hoped but personally I don't mind and I know that you understand as well! Love the background info, only makes ur work all the more spectacular ! Len ur work is always amazing,the inspirational info only makes it that more spectacular!